Mashed potatoes is one of my favorite foods…you can make them so many ways and they are just the perfect comfort food. But most homemade mashed potatoes recipes come with lots of fat and calories, which can add up to lots of Weight Watchers Points. 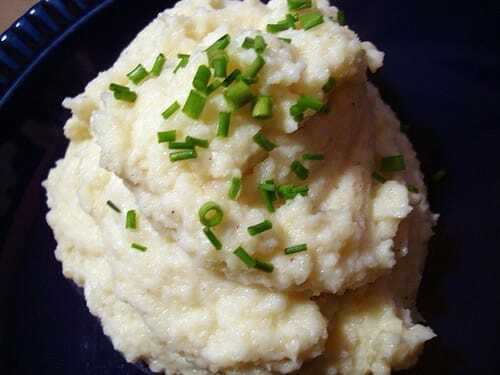 This alternative dish -Cauliflower Mashed ‘Potatoes’, is a great substitute. While I won’t lie and tell you that it’s as fabulous as traditional mashed potatoes, it definitely makes for a great low point substitute. Just by replacing the potatoes with cauliflower, you eliminate most of the calories. You’ll notice that this Mashed Cauliflower Recipe still uses one small potato. This helps the dish to keep a texture similar to that of regular mashed potatoes and helps add a bit of potato-y flavor. The end result is really quite tasty! And though this is not an official Weight Watchers Mashed Potatoes Recipe, it’s a great meal idea for anyone who wants to eat more veggies and cut excess calories. Top with chives or green onions if you’d like! Bring a large pot of water to a boil, and add about 1 tbsp salt; add the cauliflower, potato, and turnips as they’re prepped. Reduce heat to maintain a fast simmer, cover and cook for about 20 minutes or until vegetables are cooked through. Drain well and transfer to a food processor. Process until smooth. Return pureed cauliflower to the hot pan on medium high heat. Stirring often, cook off the excess liquid, about 5 – 10 minutes. Stir in remaining ingredients. Transfer to serving bowl. Serve and enjoy! Looks very good – I will try this for Christmas dinner! OMG ~ the best. I have been trying to convert the family to cauliflower rice and it’s been a challenge. I made this and it was all gone. I think I will double the batch to have leftovers. This recipe is fantastic! I made it for dinner and, like Nancy, the dish didn't seem thick like the picture. Still tasty though! I saved/refrigerated the leftovers and viola, next day quite thick and even yummier!! Now day 3 and I swear its even better than the day before. I just stumbled upon your website! I just love these recipes- keep up the great work!! !